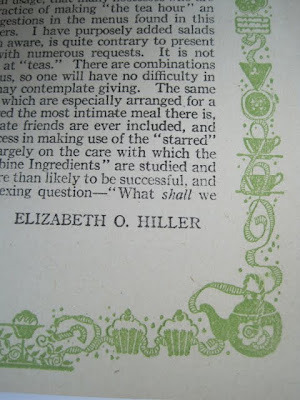 One of my recent vintage finds was this "Calendar of Luncheons, Teas and Suppers" by Elizabeth O. Hiller. 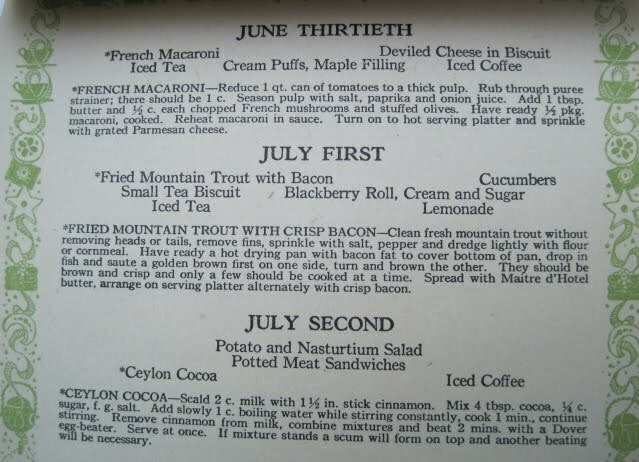 I just love reading through old recipes, and I especially love coming across old teatime recipes because it's interesting to see which tea foods of yesteryear are still popular today. 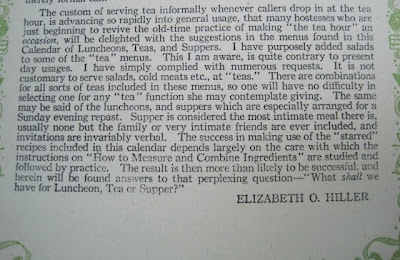 I hope you can double-click and read this OK, because I am intrigued that she referred to "the old-time practice" of having a tea hour. 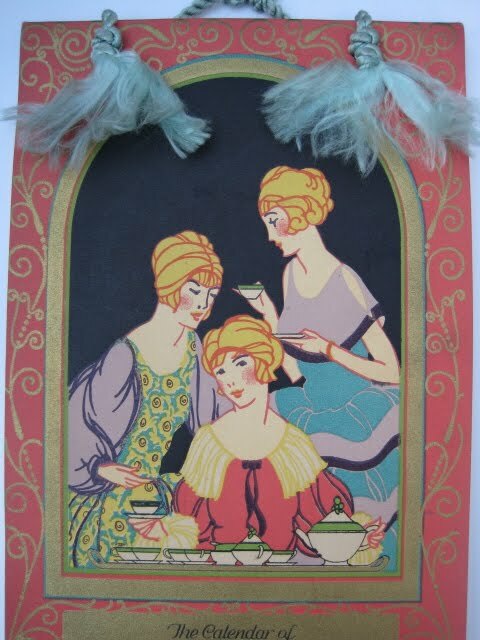 This book is from around 1915, so "old-time" to her meant something *really* old-time to us today! The teapot and teacup graphics appearing on all the pages are just so lovely, I think. The flip-calendar format is intriguing, and the pages are rather large -- about 5-1/2 x 11 inches. 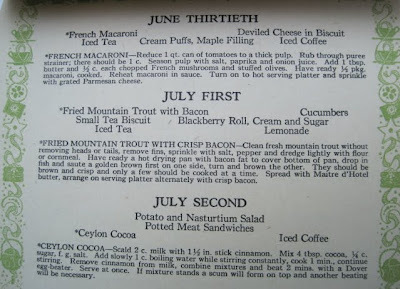 Each page of the calendar lists an entire week of menu suggestions, and each day includes one recipe from the day's suggested menu. 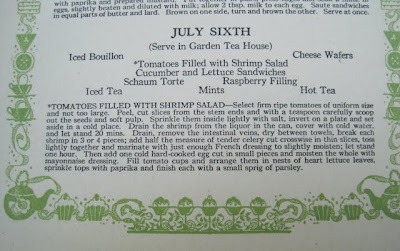 And finally, I found it amusing that the ingredients you would need to assemble for this recipe include a tea house! 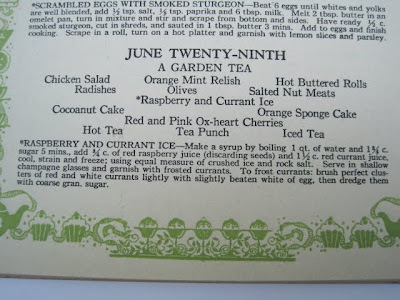 Looks to me like only Marilyn will be making this anytime soon since she is the only woman I know who currently has a tea house. Do you enjoy reading old recipes? Do you actually use any of them? I'd love to know! It was time. 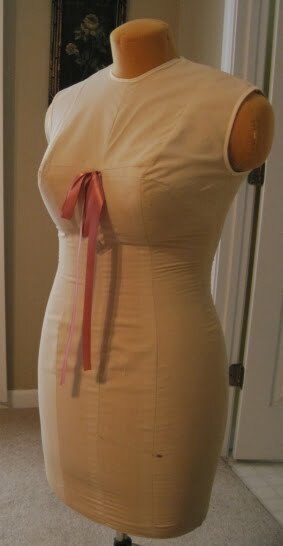 My mannequin Matilda's look was -- how to say this nicely? -- Dated. Mousy. Plain. She was long overdue for a makeover. 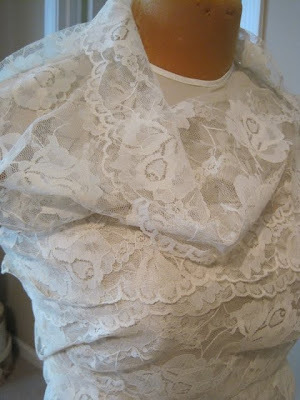 "Lace," I had been thinking. My friend Deberah gave me a huge length of wide scalloped lace a while back, and I decided it would become Matilda's new frock. There. A girl's got to have accessories, though. I like pink ones. Sets a nice vintage tone for her new look. ... and this Bakelite one, the first-ever Bakelite teapot pin I've come across! 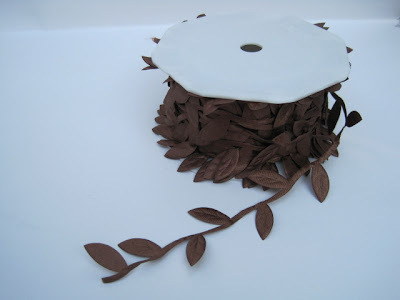 It's large, about two inches, and dark brown, and I cannot wait to wear it this fall. Matilda may wear it until then. "More is more" when accessorizing, however, and Matilda never said to stop, so I didn't. I wondered what my husband would think about her and was quite relieved when he said, "That's cute!" 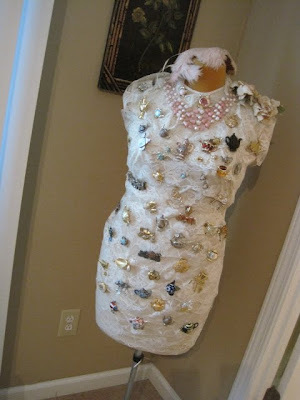 What girl doesn't like to be complimented on her new look? 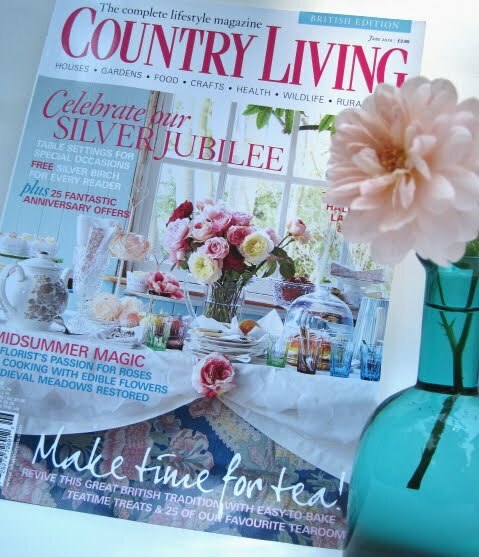 Many of us love to come across a great new tea book, but I am here to tell you the June 2010 issue of Country Living, the British Edition, is one you are going to want to get and keep! 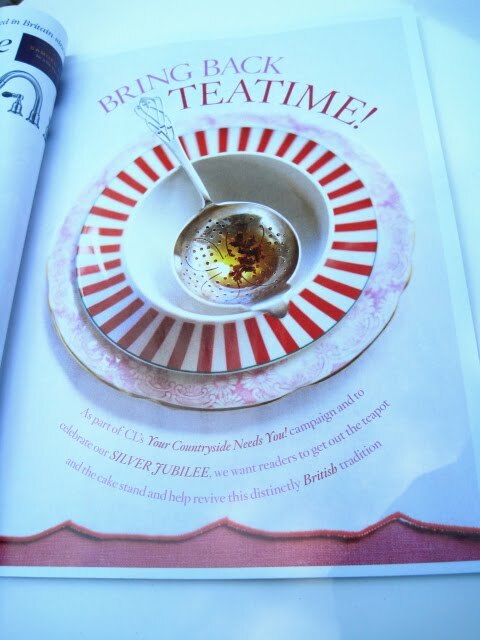 It's the magazine's 25th anniversary, and they are celebrating their Silver Jubilee with a campaign to "Bring Back Teatime!" This magazine is always one of my favorites, but when I saw the words "Make time for tea!" on the cover I knew I was in for a treat! 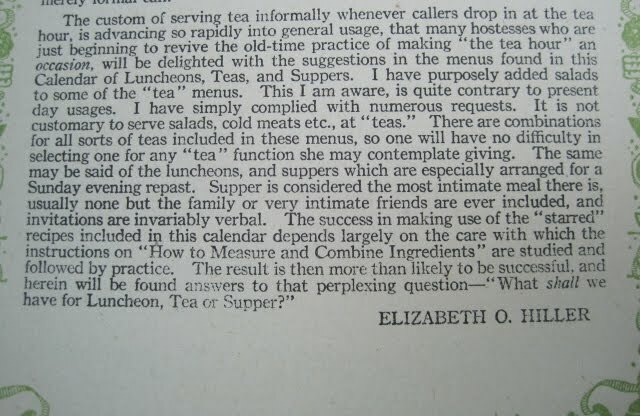 Could you ever have imagined the British would need to be encouraged to bring back teatime? 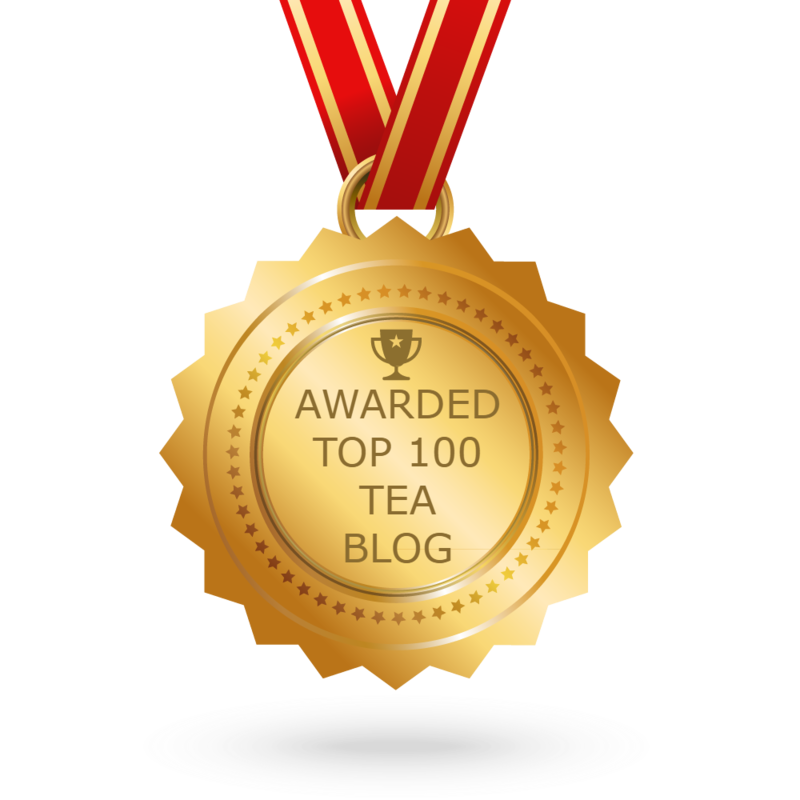 The magazine's own survey found that 96 percent of readers feel the custom of taking tea has been lost from their busy lives. 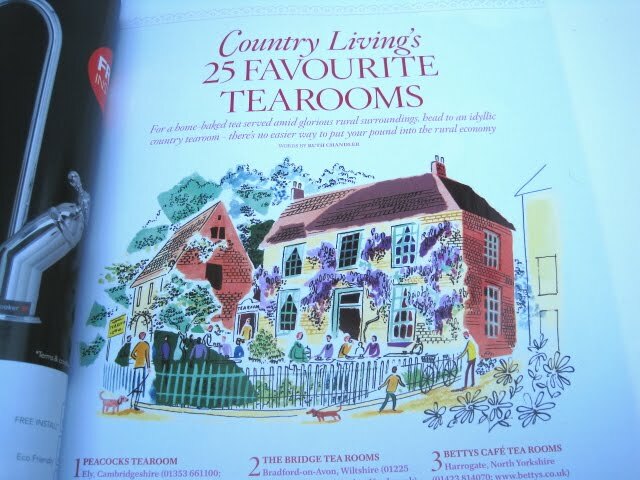 Readers of this issue, however, will have no excuse for not resuming their tea habit. More than 20 of the oversized pages are dedicated to tea, including articles on teatime treats (there's a simple but unique shortbread ring recipe I'm especially eager to make). 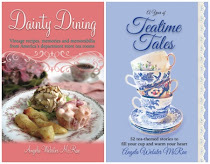 "Set the Scene for a Country Tea" offers four different table settings for teatime and offers lots of eye candy. If you're like me, you'll be reading every word of the "source" listings to find out who made all these wonderful teawares! 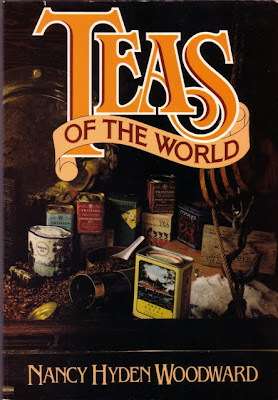 Tea and Books Saturday #26 - "Teas of the World"
Let me just start this week's review by saying this: I give bonus points to those authors who researched their tea books pre-internet. 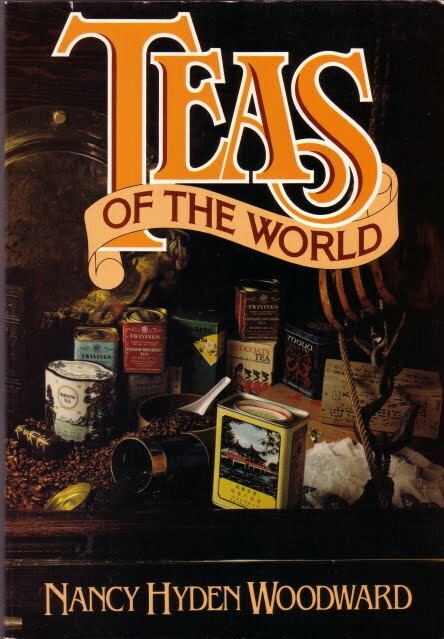 I greatly enjoyed this week's read, "Teas of the World" by Nancy Hyden Woodward, and I must say I am very impressed that such a book was published 30 years ago. This is a tea book I've had sitting on the bookshelf for a while, one I put off reading because I assumed it would be so similar to some of the other general tea books I've read. Happily, it immediately shot to the top of my list of favorites for the year. I was pondering why this is so and decided it's simply that I really like Woodward's style of writing. The journalist in me appreciates clear, sharp writing, that in which the author says what he has to say and gets out of the way. Woodward excels at this, and her book is simply jam-packed with great information. 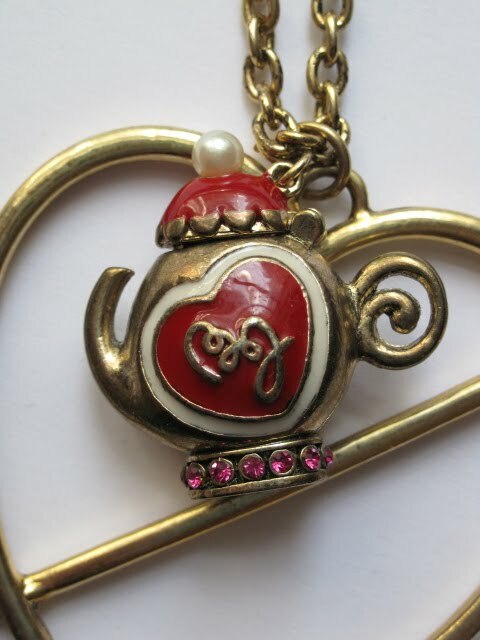 You will feel tea-smart just for having read it! Thanks to her book and a few others I've come across this year, I am becoming much more interested in tea's history in the East. 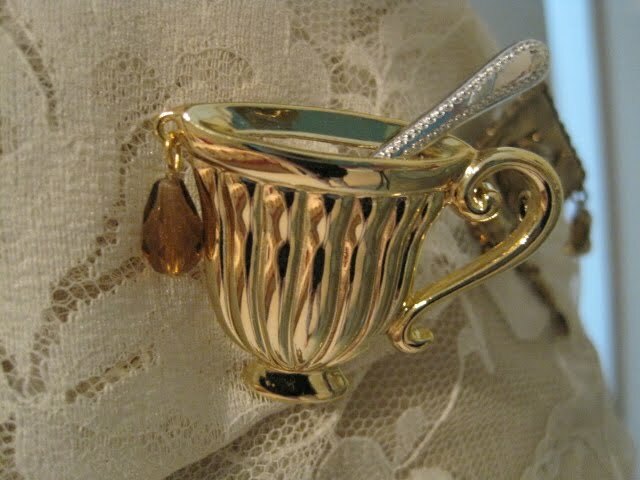 In the section on Tea in Japan, Woodward writes about a time when respect for tea utensils was so high that when an army was about to attack a castle, "the enemy leader within lowered his family's collection of tea utensils, carefully wrapped in brocade, to protect them from the destruction about to ensue." Amazing! 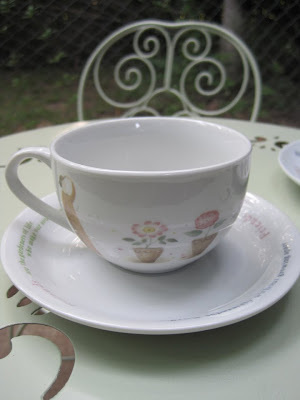 Earlier this year I read that the French were the first to introduce the idea of adding milk to tea. 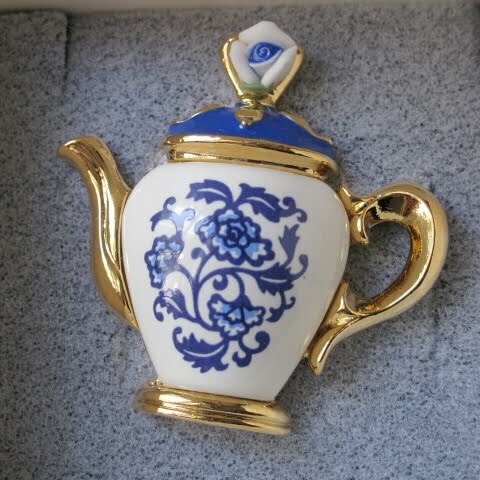 Woodward provides even more information, noting that "1680 was the year in which the first mention of milk being added to tea was made in Europe. The reference appeared in one of the 1500 letters ... written by the witty and acute observationalist of social history, Marie de Rabutin-Chantal, Marquise de Sevigné. 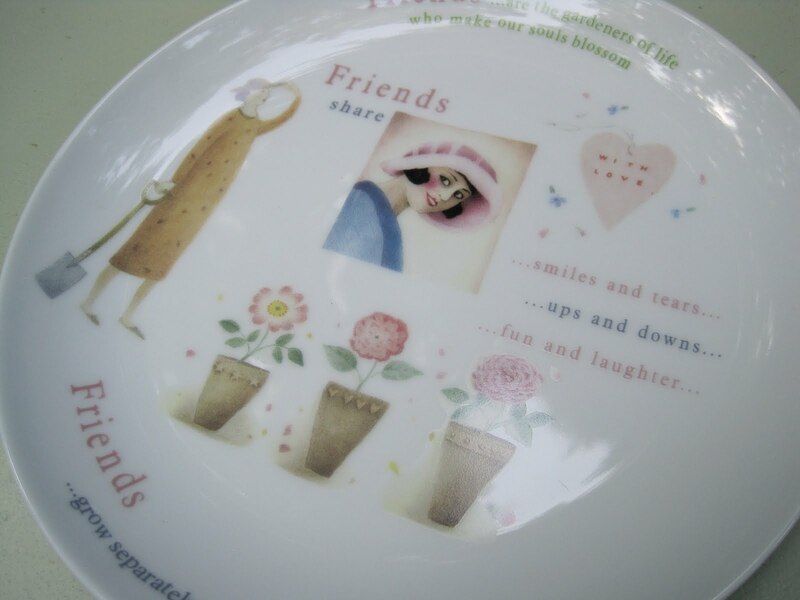 Her friend, Mme. de la Sablière, had poured milk into her tea." 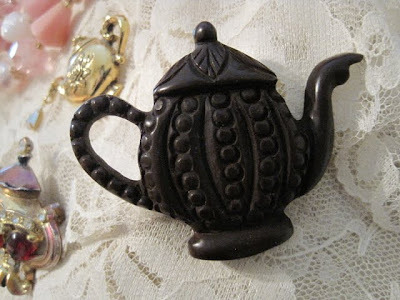 I enjoyed reading about English tea smugglers, and I enjoyed reading that William Ewart Gladstone, who served Queen Victoria as prime minister, "probably was the only resident of London who went to bed every night with a hot water bottle filled with tea at his feet." To warm his feet? No, Gladstone wanted to make sure he had tea to drink when no one was around to prepare it for him! 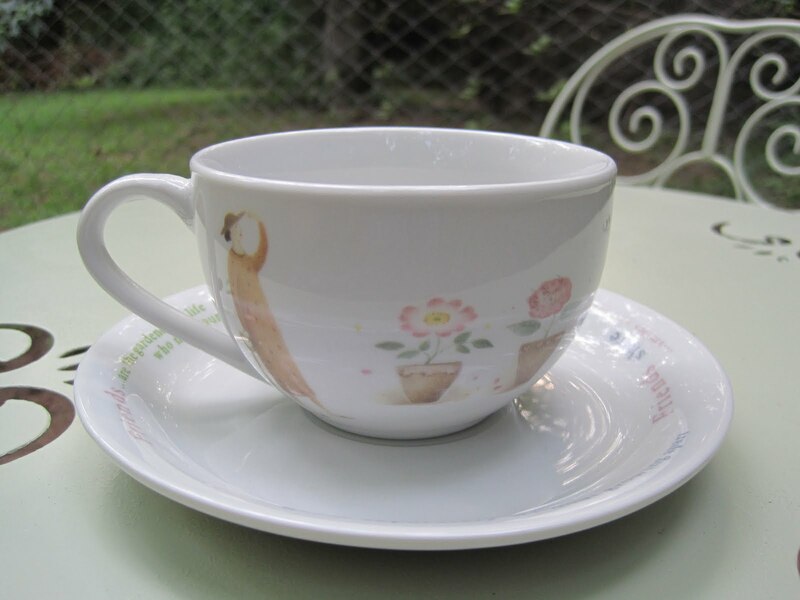 If you've read much tea history at all, you know that the coffee blight in Ceylon in 1869 resulted in the loss of coffee plants that paved the way for many tea plantations. 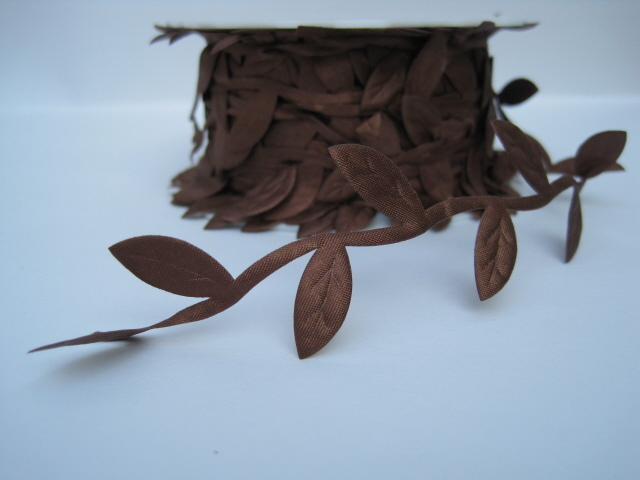 Woodward says that "finally the dead coffee trees were cut up and turned into legs for tea tables." That's the very definition of irony, isn't it! Woodward also dedicates a chapter to Tea in War. Although I'd read about the importance of tea breaks and tea canteens during World War II, I was delighted to find out more about tea's contribution to the war efforts in both WWI and WWII. 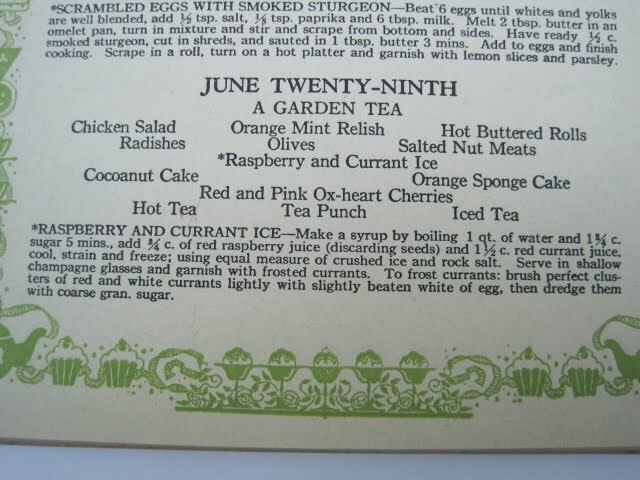 The book also includes a few recipes, a list of tea vendors (some of whom are indeed still in business), and, helpfully, an index. I am especially grateful for that index, as I can tell I will be referring to this fine book again and again! Some of my all-time favorite gifts have been things friends gave me "just because." Not because it was Christmas, or my birthday, or anything special, but "just because" they thought I'd like it. My friend Susan dropped off a gift for me at the office this week, and as I opened the gift I was thinking "Why? What's the occasion?" I could only smile when I saw the pretty print on this wallet, for my friend well knows I have the tote bag and duffel bag so *of course* I would want the matching wallet! How thoughtful! I wish I had a source for these pieces I could share, but I can only tell you this comes from "The Mart" in Atlanta, where my friend and her family have buying privileges. Now I would have wanted this whether or not I actually needed a new wallet, but it just so happens I have been in the market for a new one anyway! 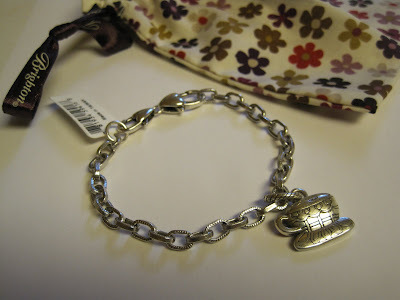 I bought a cute but small wallet some months back, and the "kiss lock" closure often pops open, which is not good at all. This is the perfect replacement! It's also great that this wallet comes with a detachable strap, so if I'm out and about and don't need to carry a purse (out flea marketing, perhaps? 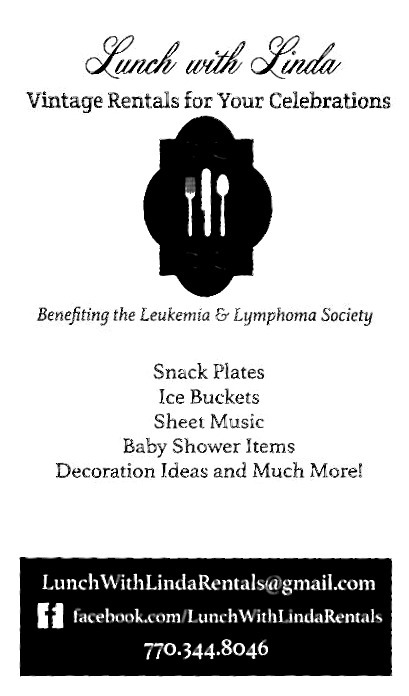 ), this will be just the ticket. 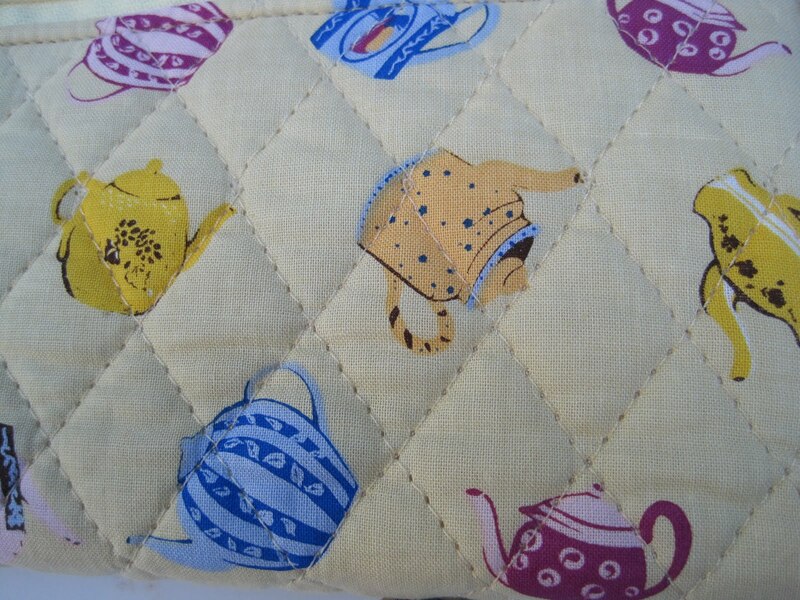 How could you not like such a cheery yellow print? And something I'm going to put in my new wallet? 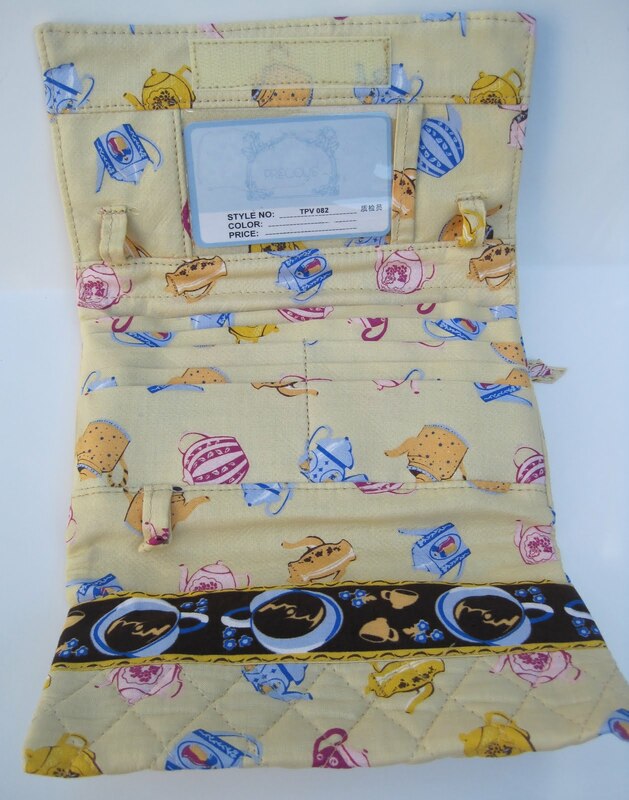 The new checks I recently ordered, one design of which features teacups! 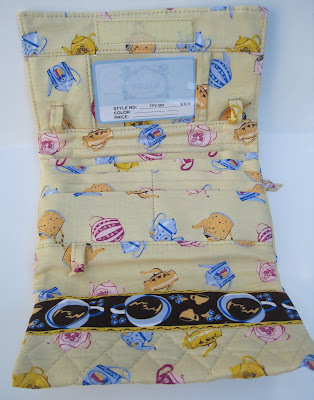 I didn't know Walmart did check printing until I began researching teacup design checks online, and I love their Simple Blessings checks. And now I even have a pretty place to keep them! 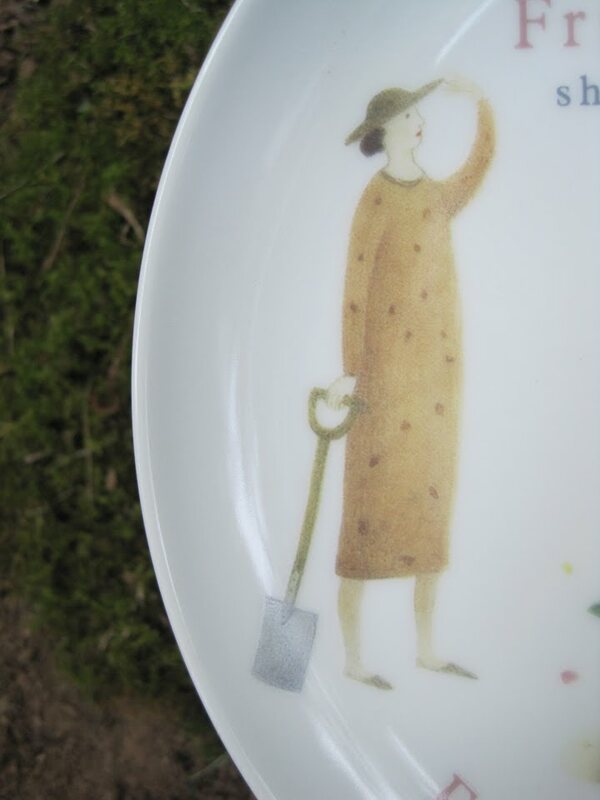 One of my Christmas gifts from my parents last year was a garden-themed trio designed by Judith Glover, a set similar to the one I showed earlier this year. I've been saving this set, though, to use in my little tea garden that is underway. My small, fenced garden won't be quite ready for Better Homes and Gardens for a while, I'm afraid, but for now I can report that the Cup and Saucer Vines have finally climbed to the top of the fence and should actually bloom around mid-summer. The 'Teatime' Four O'clocks are growing well, but it's too early for blooms on those, too. So meanwhile, I've worked on furnishing the tea garden with a newly spraypainted iron table and chairs ("Celery" is the color) and these whimsical Judith Glover pieces. 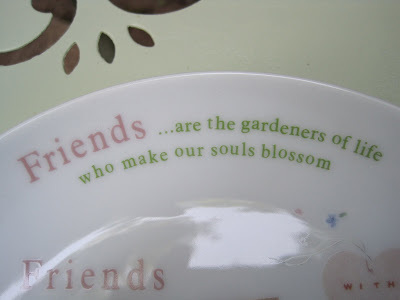 I like to think the lady gardener and the flowerpots represent me and my little gardening efforts! And here is the matching dessert plate. I love the sentiment shown here! 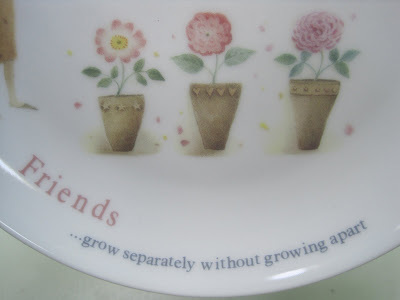 Also love the sentiment with the flowerpot graphics. Recently, my sister was discussing with my almost-5-year-old niece, Amelia, the fact that Amelia will be in kindergarten this fall. Amelia wanted to know about her older sister, Cari, and asked, "Which garden will Cari be in?" 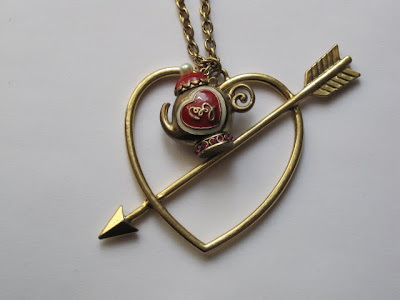 Don't you love that? And I hope they will all at least visit in MY garden eventually! "Dozens of Ways to Repurpose a Tea Towel"
Many of us have collected a cute tea towel or two over the years, and there's a great new book out I'll bet some of you will enjoy as much as I do: "Dozens of Ways to Repurpose a Tea Towel" by Nathalie Mornu. 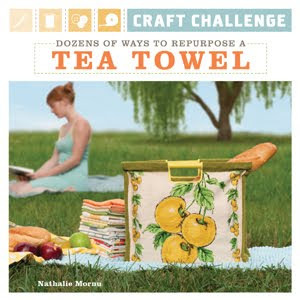 This is a great "idea book" for fellow crafters, but even if you don't enjoy crafting I'll bet some of you would enjoy the wonderful information on tea towels in this book. 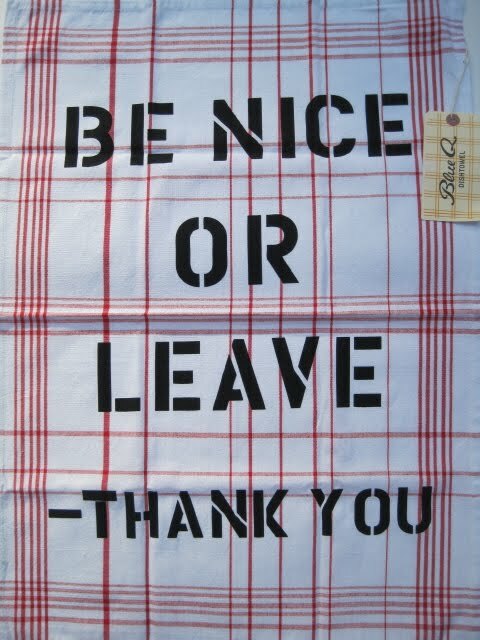 So first things first, what IS a tea towel? "Just think of it as a term for a fancy kitchen towel," Mornu says. 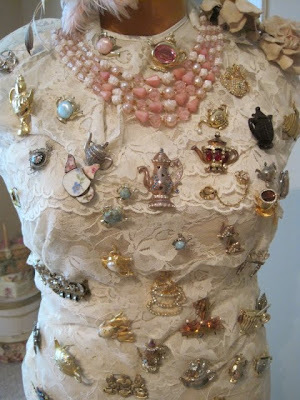 In one of the sidebars, she goes on to say this: "The eighteenth-century meaning of the word described a cloth used by the mistress of the house to dry china tea-sets too fragile to be handled by careless servants." 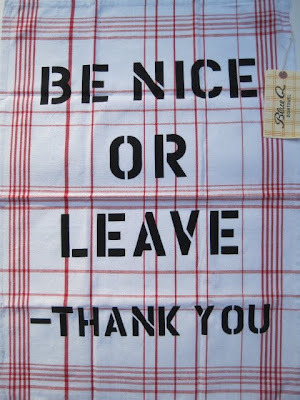 For those who can bear to slice into their tea towels -- and let me say right now I'm not sure I'm ready! -- the projects in Mornu's book are cute-cute-cute! 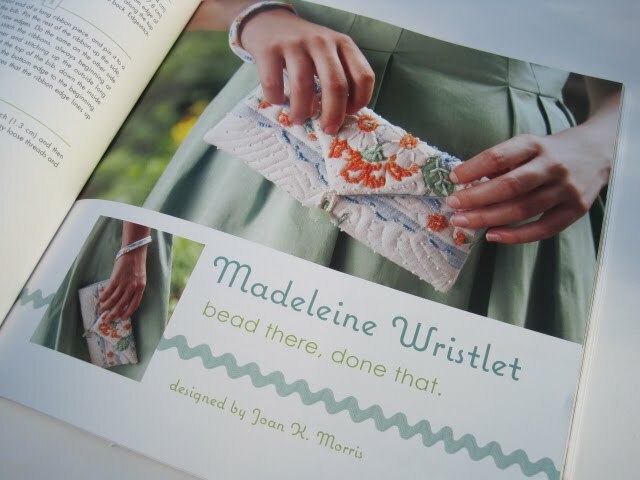 A skirt for a little girl, a woman's belt, a toddler's bib, and a woman's halter top are some of the clothing projects in the book. 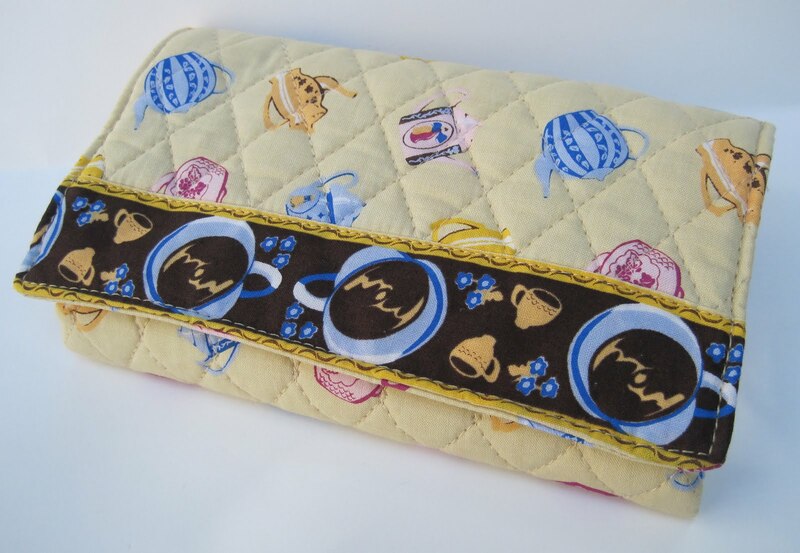 There are also tote bags, aprons, an eyeglass case, and my favorite, the "Madeleine wristlet," which is a small beaded envelope purse in which the design is bead embroidered right on top of the tea towel's graphics. (I do have a duplicate of one teapot design tea towel, so perhaps I can turn it into a project or two.) Mornu includes lots of helpful sewing tips, and while you don't have to sew to enjoy this book, if you do, sew much the better! Summer is my busiest time of year at the office because, in addition to our regular bi-monthly magazine, we are working on an annual newcomer's guide. That means a lot of proofreading, a lot of marking up pages, and a lot of Sharpies! 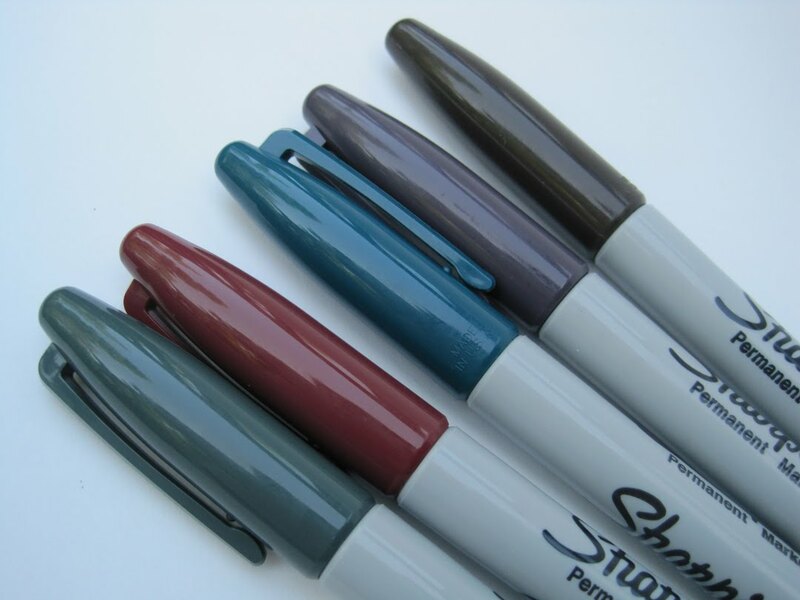 I love my Sharpie markers. I like the size, I like the way they write, and when they start to run dry, a trip to the office supply store becomes necessary. Now given a choice, I prefer colored Sharpies to the black ones. For one thing, when the art director and I are making corrections to pages, it is helpful if her corrections are in one color and mine in another. When I'm choosing new markers, I always reach for whatever the newest Sharpie colors are, and the latest ones are these limited edition "Couleurs Café." 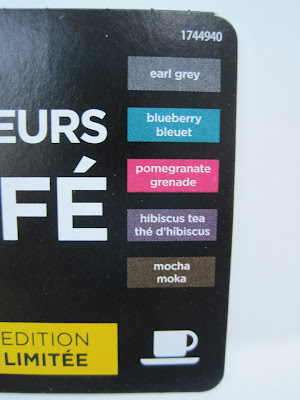 And what "couleurs" do they include? Earl Grey, Blueberry, Pomegranate, Hibiscus Tea and Mocha! I think that definitely says something about the popularity of tea in today's world, since four of the five choices in that café are tea-related. 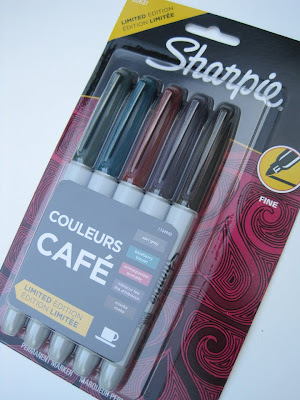 It also means, of course, that my new favorite Sharpie colors are Earl Grey and Hibiscus Tea! Phyllis! And I believe I already have your address on hand, but I'll check with you to make sure before mailing your new bracelet. Congrats! 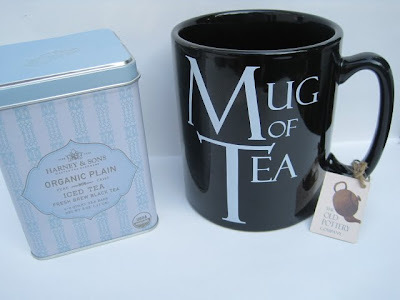 Now that would have been quite enough, but my bottomless (it seemed) gift bag also contained a new giant tea mug and some Harney and Sons iced tea -- quite welcome here in the hot and humid South! 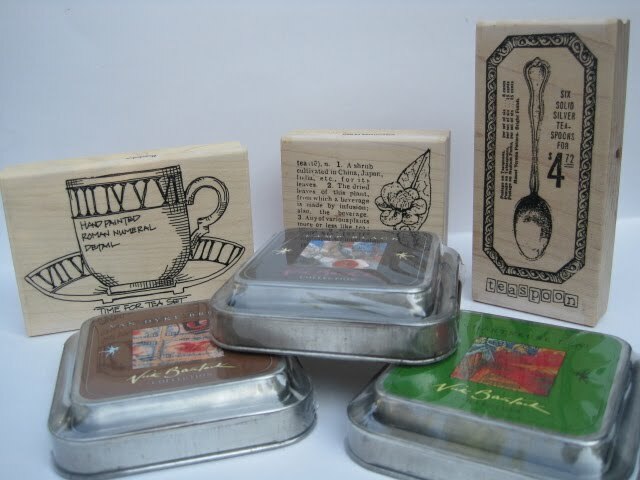 There were also some crafty items from her shop, and I don't guess Lynn could have known it, but I have been coveting some of these Stampington and Co. tea-themed stamps for years! An old rendering of a cup and saucer ... the definition of camellia sinensis ... a vintage look design of a teaspoon ... and some great Nick Bantock inks in Van Dyke Brown, Chartreuse Leaf and Lamp Black -- all perfect tea colors! 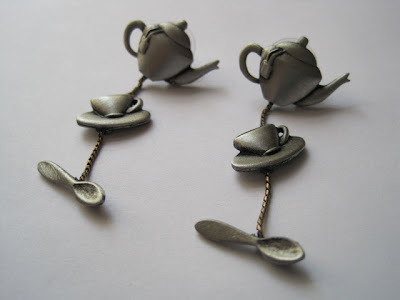 And speaking of tea leaves -- I have some! 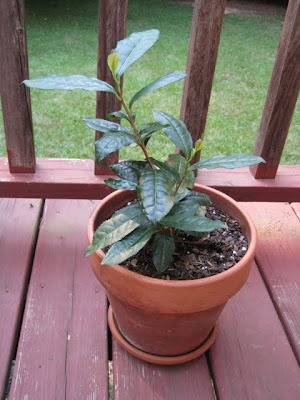 Suddenly, it doesn't matter so much if my camellia sinensis seeds produce (although that would be nice! ), because I now have a live tea plant of my own. Can you believe Lynn went to the trouble to bring this to me all the way from North Carolina? 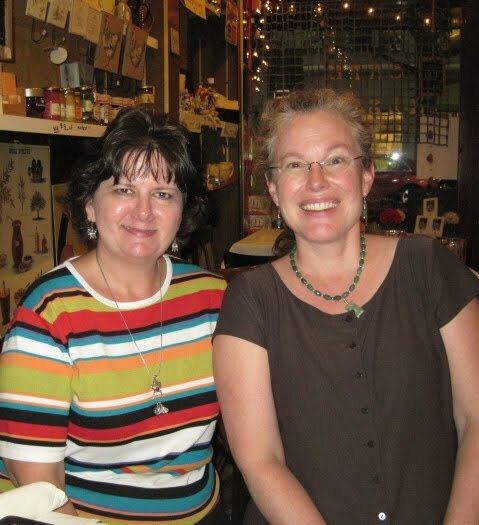 Her gifts are all so lovely and so appreciated, but I think the best gift of all was simply that a kindred spirit sought me out when she was planning her trip to Georgia! It was, indeed, an evening of Frivoli-tea! Tea and Books Saturday #25 - "The Charms of Tea"
Years ago, a girlfriend and I took a brief road trip to Warm Springs, Ga., home of FDR's Little White House and the marvelous shopping village there. We had browsed in many of the stores already, but I opened the door of one particular shop and instantly knew I was at home. Soft, lilting music was playing. The air was perfumed with potpourri, soaps and scented candles. 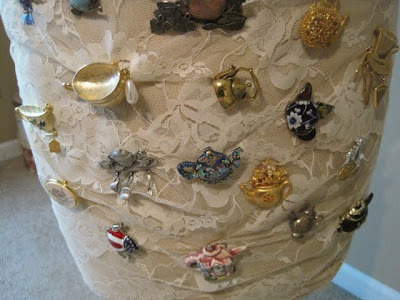 The shop was well-stocked with laces and linens, angel figurines, and so many beautiful things with roses on them that I thought I was in retail heaven! 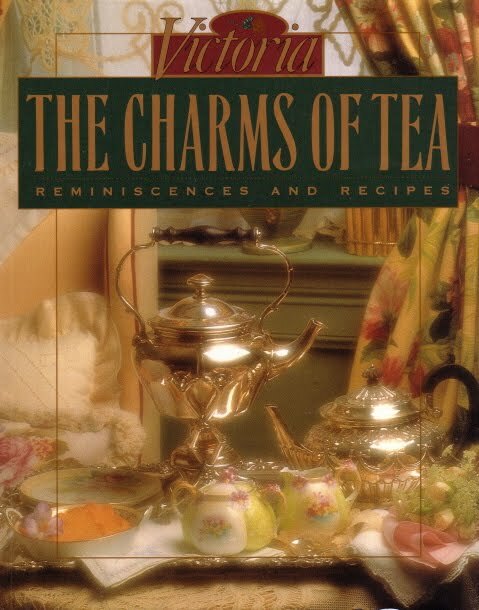 The store has long since closed, but I've never forgotten one of the happy treasures picked up there that day, one of my very first tea books: The Charms of Tea: Reminiscences and Recipes from Victoria magazine. Victoria has since published several other tea books, but I have to say this early one is the volume I treasure most. It features all those beautiful images from Victoria, and it's also filled with quotes and literary excerpts that make for quite enjoyable teatime reading. 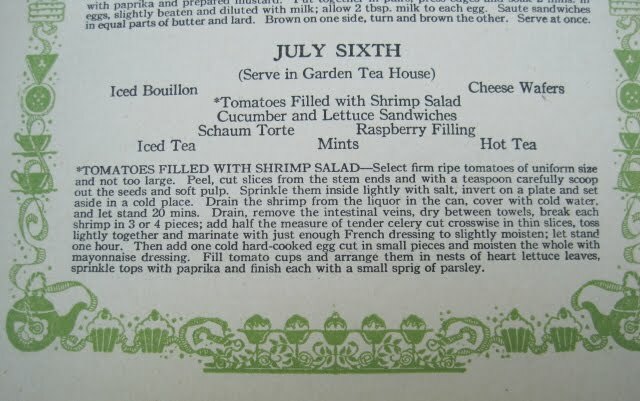 The "reminiscences" are just delightful, but the "recipes" are quite tempting as well. 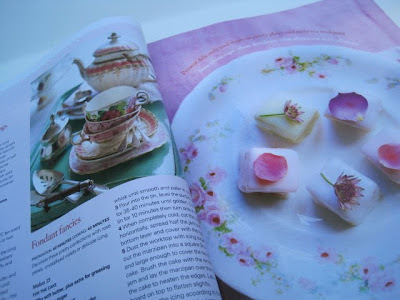 I hadn't looked at this book in a while, and suddenly the Currant Scones with Smoked Turkey (and apple jelly glaze) struck me as incredibly yummy sounding. 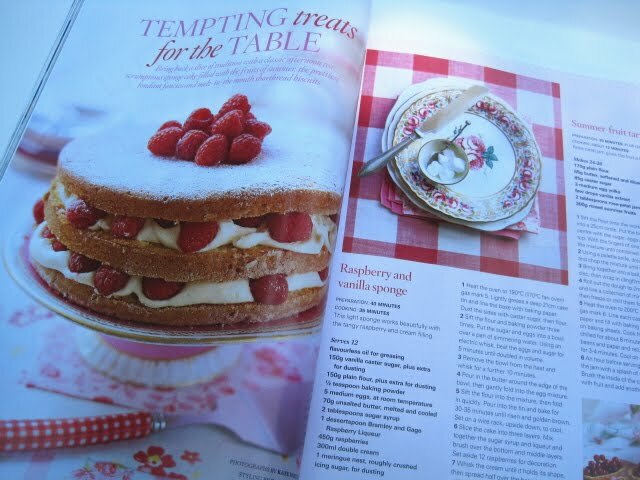 Some of the other tempting recipes are for teas (Lemon-Mint, Orange-Spice, Ginger Pear Delight), savories (Herbed Cream Cheese Sandwiches, Salmon Mousse, Spinach Cheese Tartlets), breads (Sage, Pumpkin Nut, Milk and Honey), and there are also recipes for spreads, cakes and cookies. I like the quote from the book's introduction which describes tea as "a comforting ritual, simultaneously soothing and stimulating, in which to withdraw momentarily from the busyness of our lives and pay gentle homage to the passage of time." This "gentle" book will help you do just that! 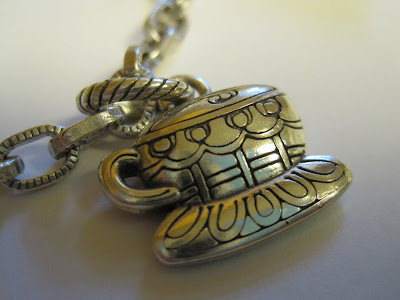 To wrap up this week of posts on Teatime Jewelry, I thought I'd share a few of the more contemporary pieces in my collection. Broken china jewelry has been around for a while, but when I saw these broken china teapot pins I knew I had to have them! The backs have the sterling 925 stamp and what appears to be "J LEE." I'd love to know more about them, but I know they're pretty and that's enough for now! 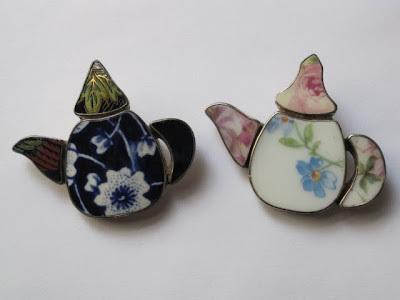 This pin is by Liztech and features work similar to a teapot pin I acquired last year. 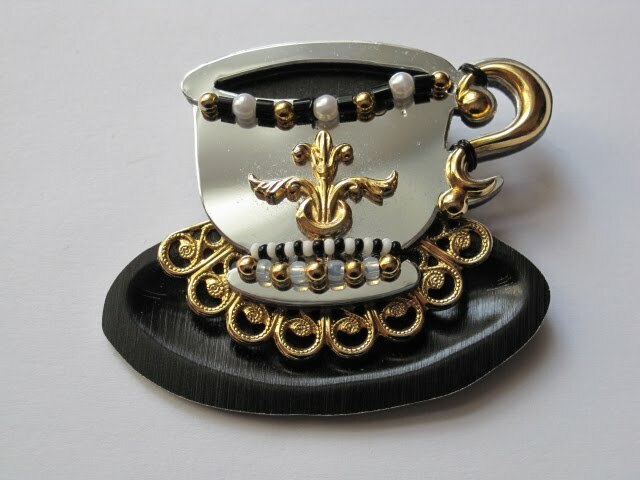 I like the fact this pin is black with both gold and silver accents, because it goes with a lot of outfits. 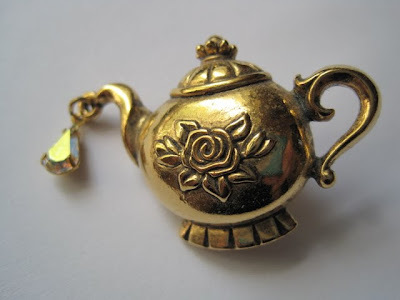 This gold teapot pin from Avon was made in the nineties, so it's not new but it's not exactly vintage either, and I wanted one while they're still easy to find. 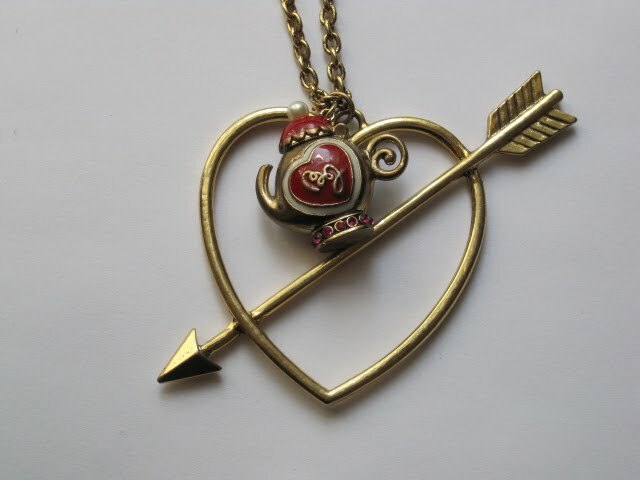 I read in a jewelry book that this is a *very rare* pin, but in my experience you can find them for a few dollars on eBay most of the time. 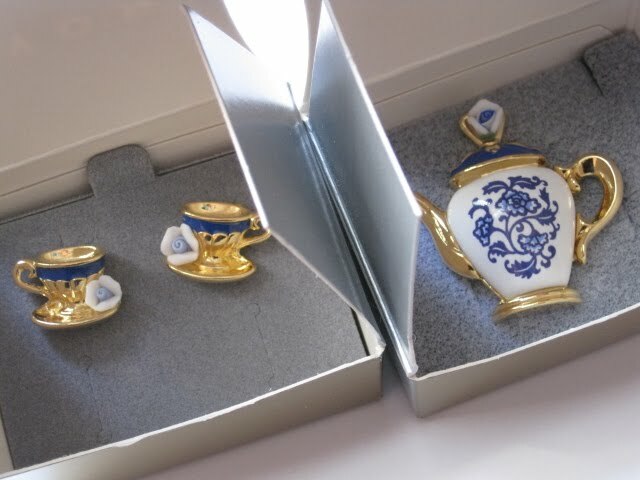 Another recent Avon design is this blue teapot pin and matching earrings. I love the blue and white on these! 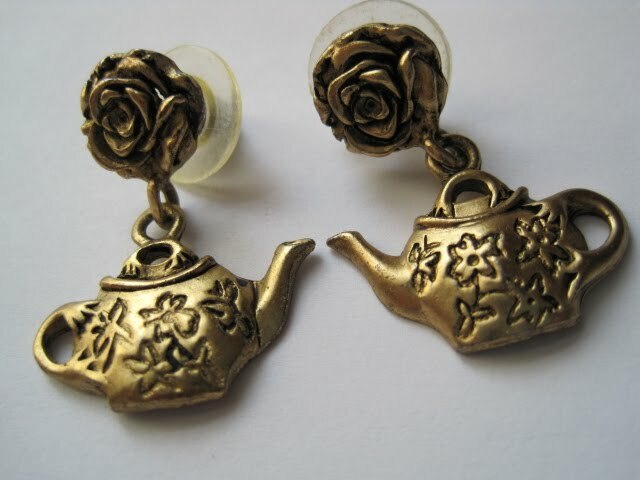 And another recent find, these gold earrings with teapots are a little on the gaudy side, but when I've needed gold earrings they've come in handy. 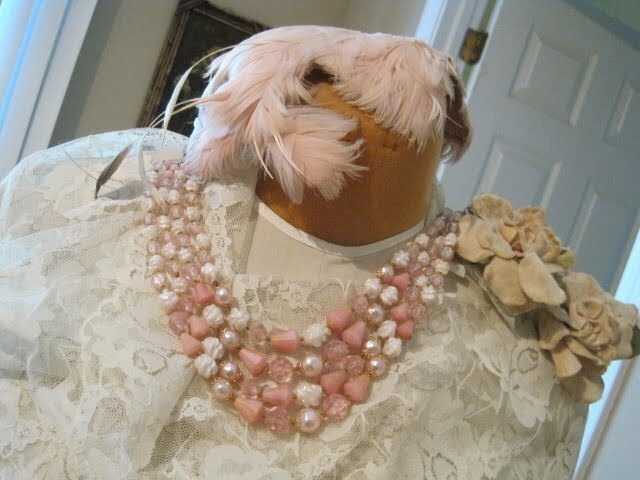 Jonette Jewelry went out of business a few years ago, but every now and then sellers seem to find some of their unsold jewelry and post it on eBay. 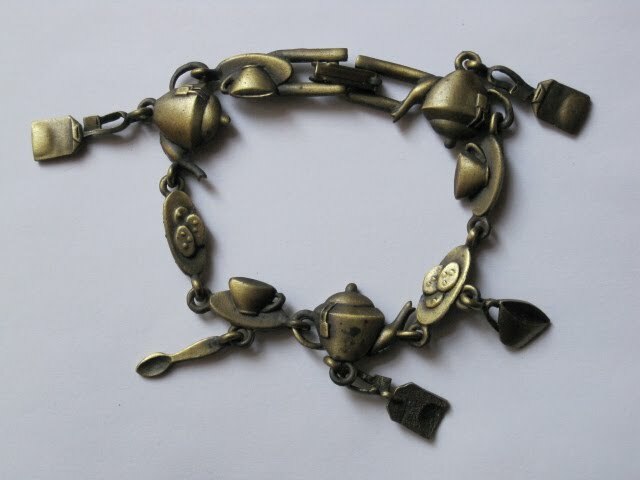 This bracelet was inexpensive and I got it for "collectible" reasons more than anything. 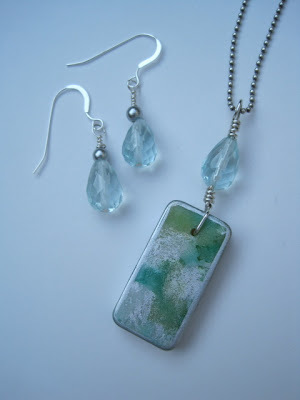 To say "thank you" for permitting me this week of sharing my jewelry obsession, I want to host a giveaway! This Brighton charm bracelet comes with the same reversible teacup charm I have (see yesterday's post). 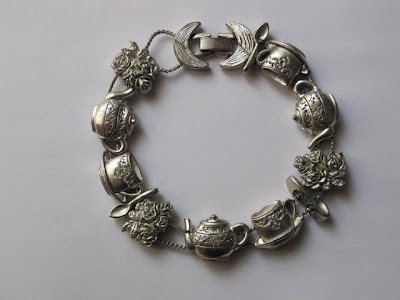 If you've commented on any of this week's blog posts about jewelry, you're already entered, and you can comment on today and tomorrow's posts as well (although tomorrow's topic will be books, not jewelry). The more days you comment on, the more days you have another chance of winning! 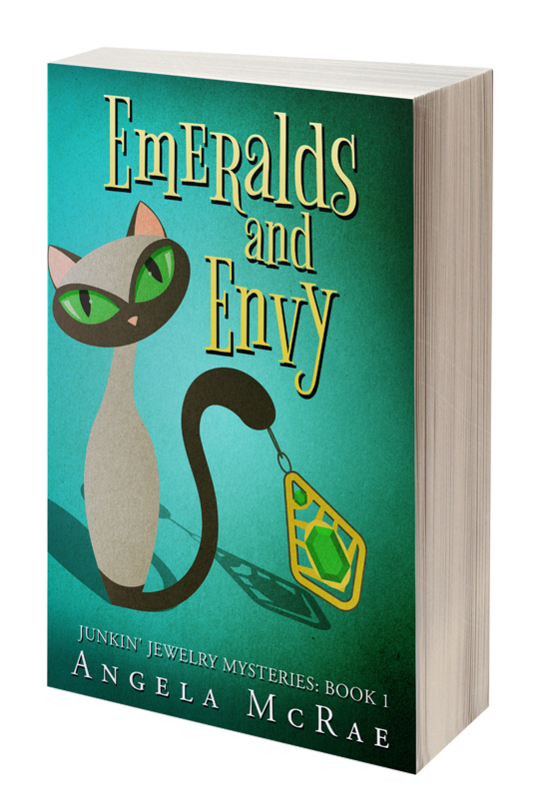 The giveaway will end at 7 a.m. EST Monday morning, June 21, and I'll announce the winner later that morning. Good luck! Growing Tea: Let's try again! 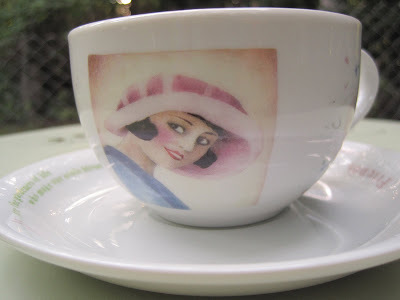 Tea and Books Saturday #23 - "Serendipitea"